I knew it was time to make some major changes in my life the moment I was peering over the edge of the top floor of a parking garage in Miami Beach in 2012, contemplating whether or not I should jump off. I was in a toxic, gaslighting relationship with a depressed, unemployed boyfriend at the time while also working crazy hours at my job for a Fortune 500 company. It still took me several months after that balmy, ominous night to officially end the relationship. He even refused to move out for several months after that but we finally parted ways the following year. I believed in the company I worked for but my job was mentally and physically draining plus I felt really under-appreciated by our region’s executives. I listened to lots of biographies, inspirational & self-help books during endless hours of driving throughout Florida for work and eventually worked up the courage to quit my job (on good terms) in 2015. I started practicing yoga at a studio in Fort Lauderdale several times per week and began to feel so much better about my body, my mind, my emotions, my past and what I wanted for my future. My lease was up soon so I sold most of my stuff and decided to wanderlust around the world. Three weeks before I left the US, I discovered I had an autoimmune disorder called Hashimoto’s thyroiditis in which my immune system seeks and destroys my thyroid. I’m pretty sure it was triggered by that personal and professional stress as I had only just turned 30. I backpacked by myself for long stretches of 2015 and 2016 and got way out of my comfort zone. My parents were terrified and told me they were questioning my mental stability. I can understand why as we didn’t tend to travel very far from home nor spend much time outdoors when I was growing up. During my self-imposed sabbatical, I completed my 200 hour Yoga Teacher Training in southern India, cared for injured sea turtles in Sri Lanka, fed, bathed and scooped poop for rescued elephants in Thailand and meditated with Buddhist monks in Myanmar. I hiked the Annapurna Circuit in the Himalayas of Nepal, hiked multiple areas of the Alps in Switzerland and got incredibly lost in the Calanques National Park in France. I improved my Spanish, taught yoga and hiked around Colombia then trekked & camped in the Ausangate region of the Andes in Peru. 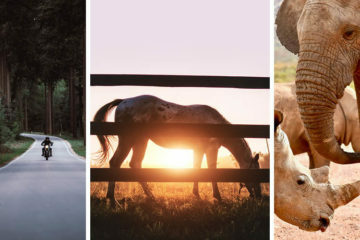 I really enjoyed these adventures because I didn’t set any specific expectations for these destinations and simply enjoyed the journey. I realized that literally and metaphorically, I shouldn’t stress so much about how many steps there are in front of or behind me. At all times, including and especially right now, there is only one more step. Hiking and traveling taught me how to be present and how to accept my true self. 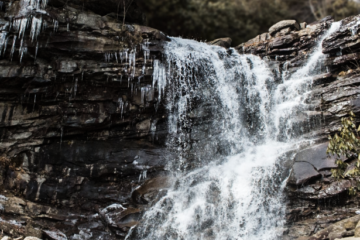 In 2017, I trusted my gut and moved to Asheville, NC. I didn’t have a plan except to figure out what I love doing and how to get paid for it. 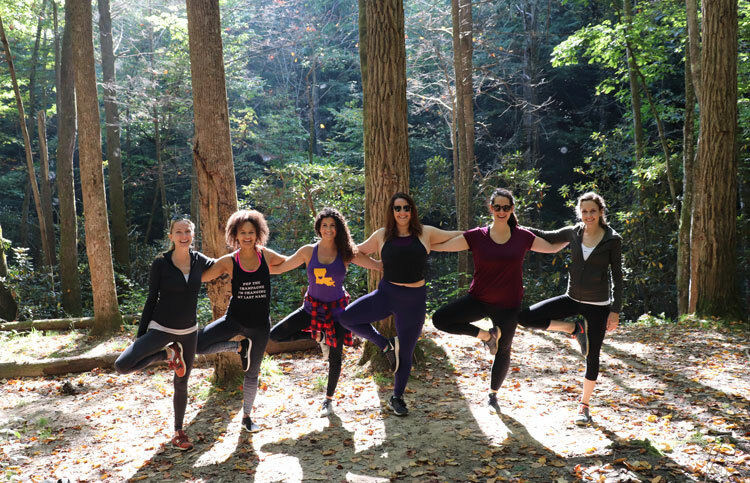 A friend planted the seed in my mind to lead yoga hikes, which then grew into my business. 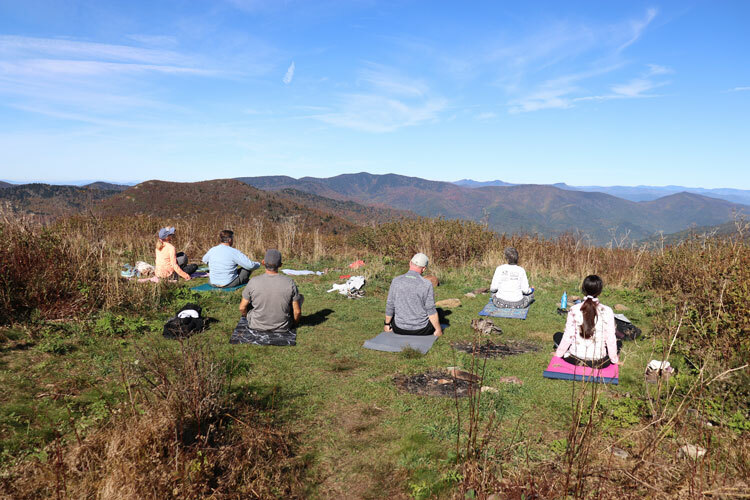 Namaste in Nature combines hiking, yoga, and meditation here in the beautiful Blue Ridge mountains of Western North Carolina. I started by hosting a few meet-ups on select Saturdays to test the concept. After some initial success I acquired the necessary permits and insurance and utilized my decade of design & marketing skills to develop my brand, website & social media. By 2018, I had some other tree-hugging yogis reach out to me and ask to be a part of this brand I was building. I hired a fantastic business coach that helped me stay focused and continue to flourish. 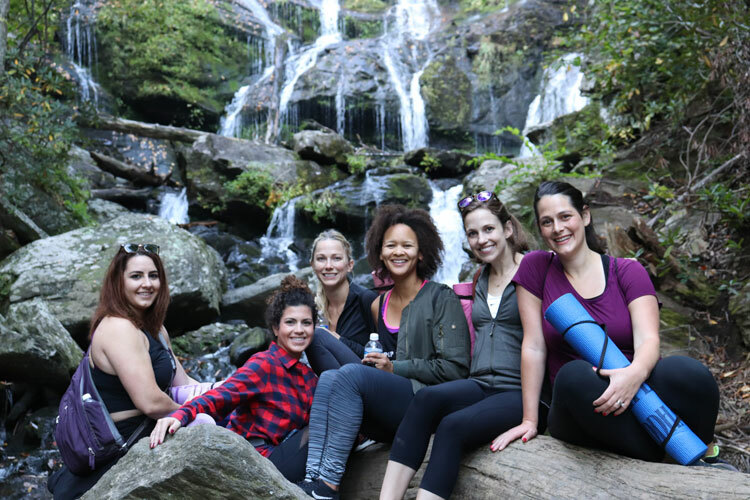 I was beyond happy to host all kinds of women who were craving self-care to deal with or celebrate major life transitions from brides-to-be & their bachelorettes to recent divorcees, birthdays, career changes, empty-nesting and more. 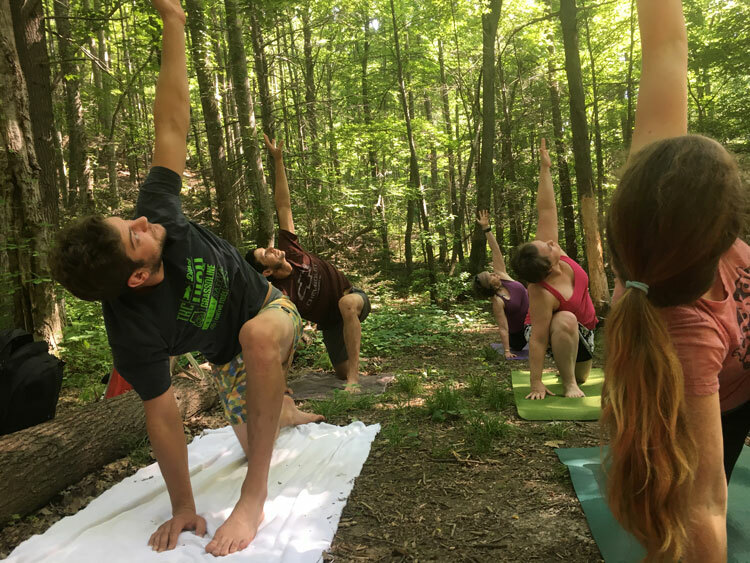 I accidentally discovered a new way to make yoga, meditation and hiking more accessible. 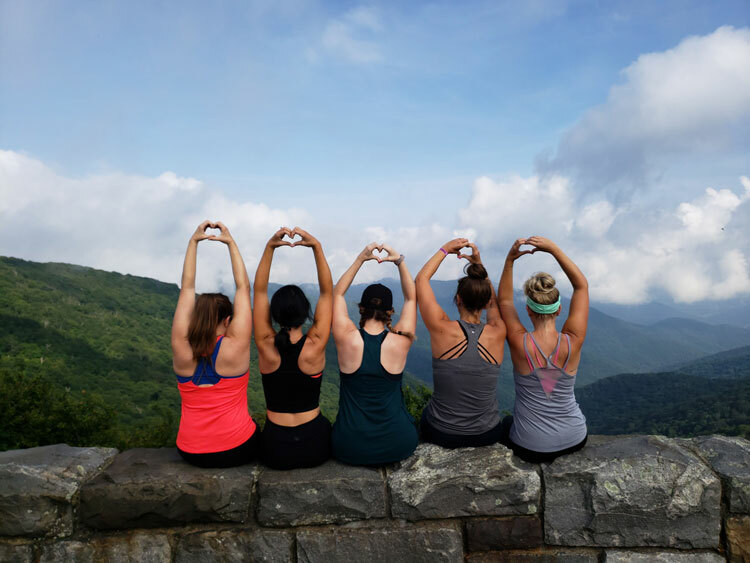 Many guests told me they are intimidated to go to a class at a gym or a yoga studio or hike alone. They don’t want to be the only one that doesn’t know the poses or be the least flexible student or be bombarded with yoga’s spiritual aspects or get lost/injured on trails. Being outside of their routines and outside in nature allows them to become less self-conscious and more willing to try new things. 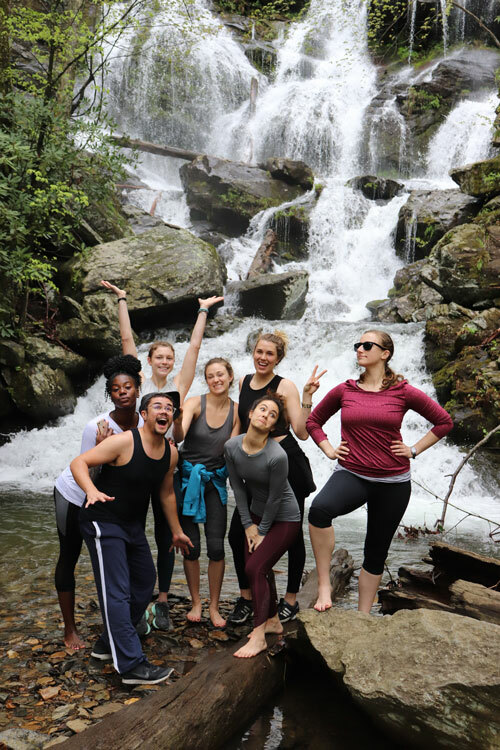 This experience also rekindles that innate connection we all have with nature, inspiring more mindfulness of environmental conservation. I am fascinated by the science & research behind the potential health benefits of practicing yoga and meditation in nature including boosting your immune system, lowering blood pressure, reducing stress, losing weight, increasing confidence, reducing depression & anxiety, improving memory & focus, better sleep and more. In 2019 I am now living my best life after I contemplated ending it seven years ago. 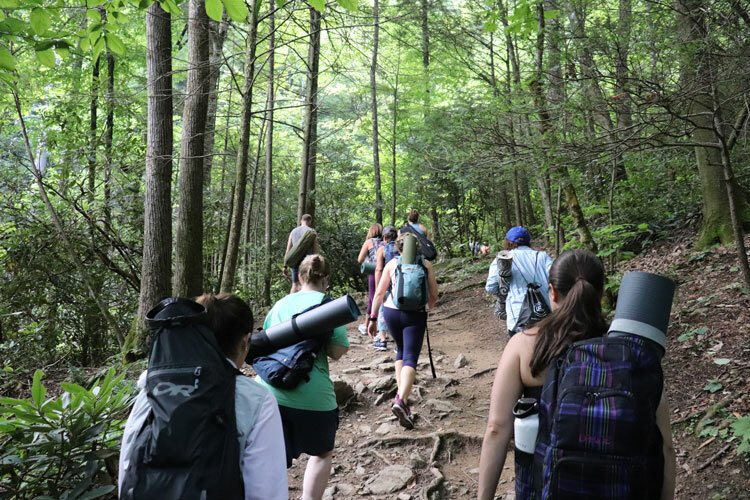 I am grateful to work with 8 other yoga hiking guides and share my favorite trails near Asheville with a diverse group of guests. I hope my story encourages you to make positive changes in your life and enjoy the journey of pursuing your passion and curiosity. 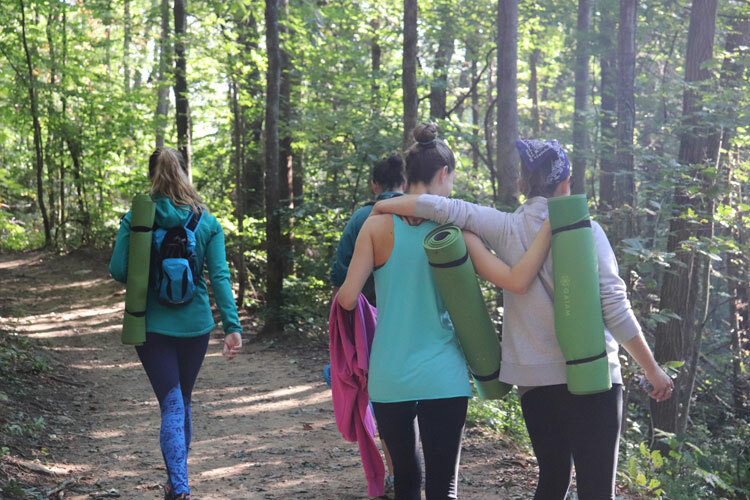 Mine led to the creation of this transformational brand & experience that encourages self-care and conserves the environment while employing & empowering women in an outdoor industry still relatively dominated by men. 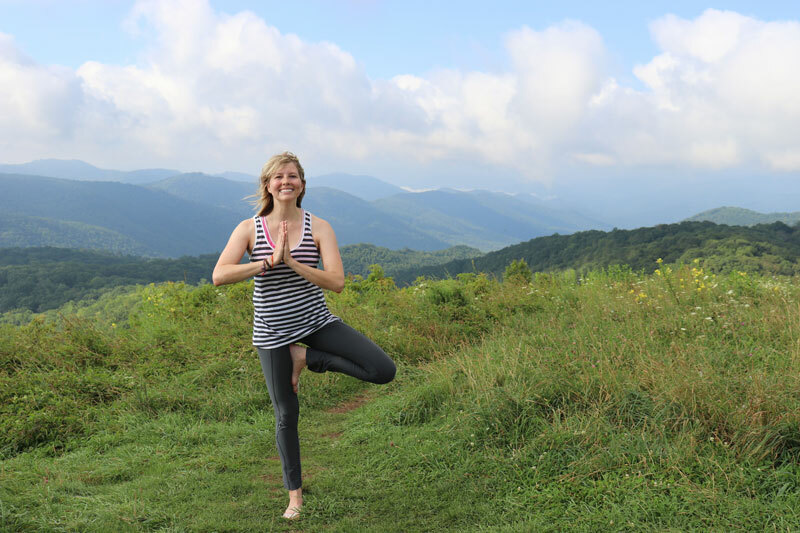 Miranda Peterson is founder of Namaste in Nature, winner of the Favorite Yoga Studio/Class in our 2019 Best of the Blue Ridge Awards.